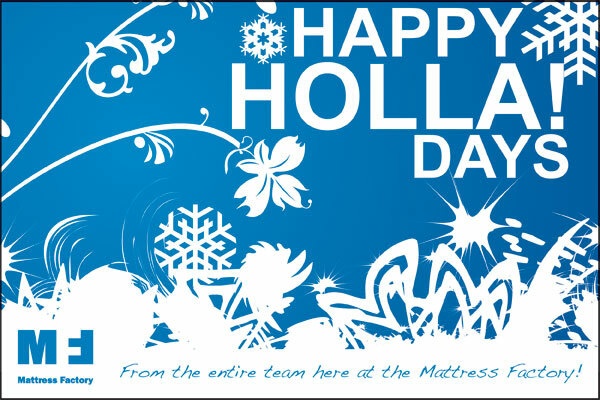 As 2009 draws to a close, we would like to take this opportunity to thank you for supporting the Mattress Factory. Your help during the past year (via Retweets, Facebook posts, attendance at events, or simply kind words) has assisted us greatly in providing residency opportunities for 45 working artists from all over the world. Additionally, your support helped spread the word of four cutting-edge, internationally-recognized exhibitions (1, 2, 3, 4); the permanent reinstallation of Greer Lankton’s It’s all about ME, Not You; well-attended educational lectures, workshops and outreach initiatives; and technological advancements (1, 2) that engage museum visitors in new exciting ways. 2009 also marked the completion of our 4-year parking lot project as well as the procurement of substantial support from The Heinz Endowments in order to considerably reduce our mortgage and stabilize the future of our organization. Nothing is Impossible, the first exhibition from our curators-in-residence Mark Garry & Georgina Jackson, opens on March 19th. Artists include Karl Burke, Rhona Byrne, Brian Griffiths, Bea McMahon and Dennis McNulty. The 14th installment of the Gestures Exhibition Series curated by Katherine Talcott opens on May 7th. Save the date for Summer in the City: The Mattress Factory Urban Garden Party – chaired by Christine Astorino – Friday, June 18th! Mark Garry & Georgina Jackson continue with their projects by curating the Mattress Factory’s first-ever music & performance residency. The residency will culminate with a one-time performance in mid-July. Queloides/Keloids, a comprehensive survey of race issues in Cuba organized by Alejandro de la Fuente, will be the first exhibition spanning both the main gallery facility at 500 Sampsonia Way and the annex gallery at 1414 Monterey Street. Opening on October 8th. 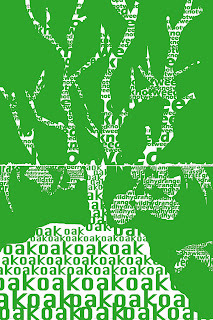 As you can see, we have a full plate next year and we’re excited to push forward and break new artistic ground in 2010. Continued support from our friends makes it all possible. Please consider extending your support by making a contribution to the 2009 Annual Fund. Thank you. You're In The Jungle, Baby. As 2009 comes to a close, many arts organizations take this time to reflect on the projects and programs of the past year as well as visualize organizational goals for the coming year. We here at the MF are no different, but I'd like to take this time to touch on a key performance and motivation metric pertaining to my department, which is loosely defined as Development, but more affectionately referred to simply as The 3rd Floor. The 3rd Floor houses the Membership, Development, Grant Writing, Marketing, Public Relations, New Media and Graphic Design departments. Sounds huge, but it's essentially just me, Lindsay, Shannon, Emily, Claudia and our wonderfully overworked/underpaid interns. As you can imagine, there is an amazing amount of work to be done by all of us and therefore time management, the ability to multi-task and an überly fast-paced work environment are key to pushing projects out the door. 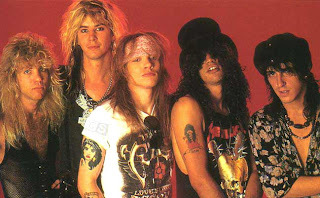 Enter one of the greatest rock bands of all time, Guns 'N Roses (pictured to the right). In 2009, The 3rd Floor played Appetite for Destruction by Guns 'N Roses in its entirety every Friday at 4:00 PM. You're probably asking yourself how this relates to producing world-class contemporary art, but bear with me for a moment, there are several reasons for our weekly ritual. First and foremost, the motivational nature of the songs on this particular record are extremely conducive to work output. The pace is perfect; the highs & lows and peaks & valleys are perfectly in their right places. It's also almost exactly 1 hour long and like an olympic long distance runner it consistently brought us rocking into 5:00 PM, a reliable and energetic close to each week in 2009. Some of our best ideas and execution came between the opening guitar lick of Welcome to the Jungle and the final breakdown in Rocket Queen. So, having said all of this, we all feel we're due for a change in 2010. This is where you can help us. Much like we did with choosing the name for the MF softball team last Spring, we're going to leave it up to our blog readers, MF Twitter Posse and MF Facebook Mob to crowdsource our 2010 "Friday at 4:00 PM" listening ritual. Here's the deal. Through this Friday, we'll take any and all album suggestions in the comments below, or via Twitter & Facebook. The 3rd Floor will then meet to select a cross-section of 5 potential albums, which we'll post here on the MF Blog next week as a reader poll. The album with the most votes by 12/31/2009 will be the winner and the person who submitted the winning record will receive their choice of three awesome MF prizes. So have fun suggesting albums and be creative with your recommendations. We're looking forward to hearing your submissions. MF + Whirl Magazine = Awesome! As many of you know, the Mattress Factory is currently in the midst of our 2009 Annual Fund Campaign, "It's All About YOU!" End of year contributions from supporters like you have a direct impact on museum operations. These donations help us sprint through the finish line of this year, while simultaneously helping us focus on achieving the artistic and educational goals we've set for ourselves for next year. And for those of you curious about next year, we've got some great things on tap including the first exhibition from our curators-in-residence Mark Garry & Georgina Jackson, the 14th installment of the Gestures Exhibition Series, our first ever music residency, the 2010 Urban Garden Party, and the large-scale exhibition Queloides/Keloids, which takes a poignant look at the topic of race in Cuba. So, today only, we're very excited to partner with our friends at Whirl Magazine on a special deal for online contributors to the "It's All About YOU" campaign. Anyone who donates $25 to the campaign today (12/14/2009) will receive two complimentary passes to the Mattress Factory and a 1-year subscription to Whirl (a $50 value!). The only catch is that you have to donate through the secret URL over on http://www.whirlmagazine.com/donate-local-charity. 3) Follow the "CLICK HERE TO DONATE TO THE MATTRESS FACTORY" link. 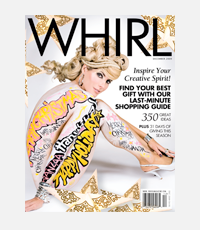 BIG thanks to our friends over at Whirl, and also to you for your continued support. The following is a guest-post from Nicole Rosato, Visitor Services & Volunteer Coordinator for the Mattress Factory. When not greeting the public at the museum, Nicole can usually be found cutting out the lines of road maps and chillin' with her dog Tango. This is her first post on the MF Blog. Hello! I’m Nicole, the Visitor Services and Volunteer Coordinator here at the MF, and I wanted to share with you a curatorial project that I'm involved with featuring Mattress Factory staff. Working in Pittsburgh museums for over four years now, I’ve realized that there are many talented artists who work within these cultural institutions. These are artists who dedicate their days promoting the artwork of others and their nights & weekends creating artwork of their own. My friend Laura Mustio and I decided to curate a group exhibition that would give some of these artists working "backstage" in Pittsburgh’s museums and galleries their own chance in the spotlight. The show is called Behind Our Scenes and will open at SPACE Gallery this Friday, December 11th from 6-9 PM. There are 34 individuals in this show, all representing a united community of artists working throughout the city. Many members of the Mattress Factory staff are involved including: Shannon Knepper (Graphic Designer), Nathan Hall (Administrative Assistant), Lindsay O’Leary (Membership & Development Coordinator), Kelley Krapp (Weekend Supervisor), Ian Page (Installer), Alice Wynn (MF Volunteer Extraordinaire) and Katherine Young (a former MFer). All the pertinent details are below and I invite you to attend the opening and support the MF artists as well as artists from: The Carnegie Museum of Art, The Andy Warhol Museum, FE Arts Gallery, Future Tenant, and Wood Street Galleries. I hope to see you there! The Pittsburgh-Green-Bridge Project is a collaboration among students at CAPA High School and the University of Pittsburgh; the Mattress Factory; artists Constance Merriman, JoAnna Commandaros, Karen Page, Heather White and David Pohl; and residents of Pittsburgh’s urban community and Greenspaces. Under the guidance of artists and with the resources of the Mattress Factory, young people are creating individual and collaborative works of public art that bridge and connect Greenspaces with Brownfield or industrial sites, providing corridors of movement and interaction among people plants and animals. Working within the structure of high school and college art classes, as well as the Mattress Factory’s teen program, a group of 15 high school students under CAPA teacher Karen Page have been matched with 15 Pitt students in JoAnna Commandaros Eco Art class. This interdisciplinary project includes study, observation, documentation, discussion, implementation and celebration. The project is providing an opportunity for budding artists in Pittsburgh by encouraging the creation of effective and environmentally-sensitive artwork. The collaboration has been centered around Japanese Knotweed, an invasive species not native to Pittsburgh that is currently impacting Schenley Park. The groups teamed with restoration ecologists to clear a pathway and collect the knotweed. An installation reflecting the experiences of the artists, students and the community will open here at the museum this Saturday from 2:00 pm to 4:00 pm. The piece will also be on view December 13th from 1:00 pm to 5:00 pm. Intelligent Design, a reoccurring series on the MF blog published by graphic designer Shannon Knepper, tackles a different design issue with each installment. This first post in the series examines the difference between high-resolution and low-resolution images. In addition to handling the lion's share of the graphic design for the museum, Shannon also runs her own design company, War Admiral Press. Ever printed something directly from a website and it came out looking like this? 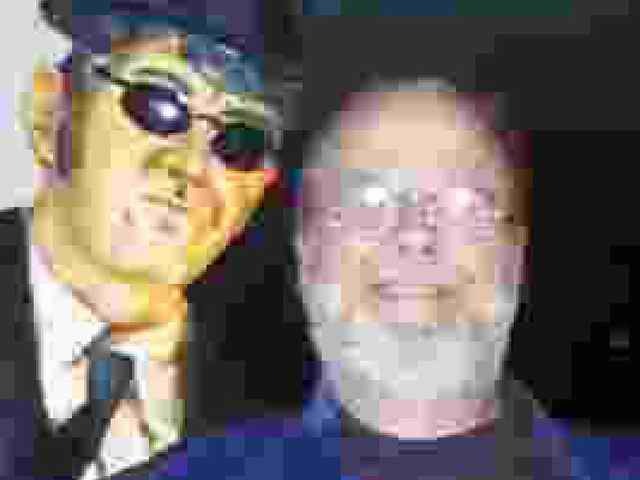 This is a low-resolution image. We could get into pixels and dots, but I’m assuming you didn’t come here to die of boredom. Basically, the majority of images on the web are low-resolution; tiny files make for faster loading. Faster loading makes for less monitor punching. And so, because designers are generally against punching of all kinds, we make images with lower resolution. They look great on screen, but terrible on paper. You wanna print something? That's where hi-res (or high resolution) images come into the picture. These images have more information crammed into the file, so that when you print it out on paper, it comes out as crisp and clean as a pair of freshly-ironed undergutchies. Naturally, these files are bigger. And not web friendly. And oftentimes NOT email friendly. Try sending a few 20 megabyte files to your friends and see how popular you become! So, the next time you print something out and it's all fuzzy, it's probably a low-resolution image; if there's a bigger file available, then go big! Or go home. Unless you are home. And then…uh…you should probably go out and do something. Seriously. This week we welcome the beginning of the 2009 holiday season. I really enjoy this time of year here at the museum because it's a popular time for families to visit. As an arts educator, watching children experience the artwork here at the MF is an amazing thing. Their enthusiasm, awe and eloquence describing their experience is continuing inspiration for me in my position as Director of Education. Having said that, I'd like to invite you and your family to join us on the day after Thanksgiving (November 27th) for Family Day at the MF. Every year on Black Friday, the Mattress Factory offers an alternative to long shopping lines and crowded department stores. This year is no different! Beginning at 10:00AM, we'll have a lobby full of hands-on art activities including a contemporary portraiture project related to our current exhibition, LIKENESS. 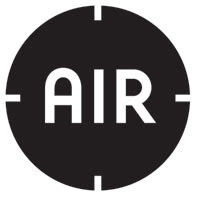 And as a special addition this year, our good friends from Artists Image Resource will be here leading a screen printing activity. As if this wasn't enough, guided tours will be given at 1:30 PM and 3:30 PM, and the BoxSpring Café will be open for lunch. All Family Day activities are FREE with regular museum admission, so forget the mall this Friday and join us for an afternoon of art the whole family can get into! I hope to see you here. One project I’m currently focusing on in the MF archives is getting our Limited Edition collection online. The items in this collection are comprised of various works on paper and three dimensional sculptures, and are representations of past Mattress Factory installations. Typically, the artist will focus on an element or idea from their large-scale exhibition piece and create a smaller-scale run of works. The pieces are then numbered, signed and made available for purchase here at the museum. Proceeds from the sale are split 50/50 between the artist and the MF. Virtually all of the work artists create at the Mattress Factory isn’t made to be sold or installed in a home environment. Therefore, the Limited Edition collection is unique in that someone can take an element of Mattress Factory art home with them. The collection currently features work from some of our permanent collection artists; Rolf Julius (pictured below), William Anastasi, and Jene Highstein. We also have pieces by artists whose work is no longer exhibiting such as David Ellis, Jessica Stockholder, Deborah Aschheim, Mark Garry, and Dove Bradshaw. Of course, I won’t be doing all of the work necessary to get these works online. In fact, much of my work will be quite invisible. I’m responsible for producing catalog information about each piece and entering that information into our collections database. We currently use a simple database platform (HINT: exciting news about this to come in a future blog post!) and most of the information is standard; artist, title of work, date, and dimensions. However, it is also important to note what type of ink was used, what kind of paper the work was printed on, or what sort of candy compound was used. I’m also responsible for properly storing these items and organizing the archive so they can be found easily and quickly. Much of this work is already complete and I’m now focusing on making sure each artist's Limited Edition documentation folder has everything necessary should someone want to purchase a piece. These documents include certificates of authenticity for each edition to be sold, information about the artist (CV or biography), press relating to their exhibition and information about the original piece that inspired the edition. Just yesterday, photographer Tom Little was here documenting the collection. Once we get the images back from Tom, I’ll gather all the relevant identifying information and send it all on to Jeffrey, who will serve it up to you, nice and pretty like, on the internet. What a year it's been here at the Mattress Factory! With the closing of Inner and Outer Space early in January, we rolled through Predrive: After Technology, Thaddeus Mosley: Sculpture (Studio | Home), the 12th and 13th installments in the Gestures Exhibition Series, the most over the top Urban Garden Party in MF history, and just last month the opening of LIKENESS and the addition of Greer Lankton's It's all about ME, Not You to the museum's permanent collection. Quite a year for art and programming. We also pushed technological boundaries by becoming the first museum in the United States to utilize QR code technology in the galleries to enhance visitor experiences. The MF iConfess & SCREENtxt projects were also innovative & experimental successes. As you can probably assume, making art and producing these programs and exhibitions isn't cheap. It costs $45 per day to house one artist in residence. It costs $733 to fly a curator from Dublin to Pittsburgh. It costs $48 a day to keep the lights on in our galleries at 500 Sampsonia. It costs $2,200 to buy a video projector for an artist. Friends, members and supporters like you help enable the Mattress Factory to continue offering an environment for artists and curators to take risks and create new work and exhibitions. 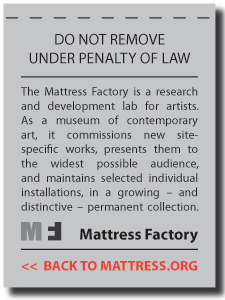 Please consider giving to the Mattress Factory's 2009 Annual Fund today. Every gift, no matter what size, makes a big difference at the Mattress Factory. A high level of support from individuals like you can help the museum attract gifts from foundations, corporations and other sources. 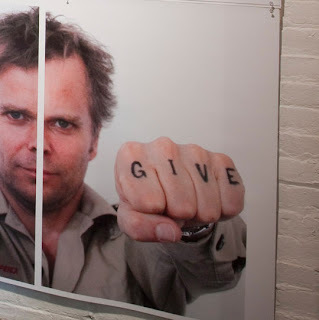 Your gift, combined with those from other friends of the Mattress Factory, helps us build a foundation to make strong exhibitions and education programs extraordinary. CLICK HERE to give $25 today! We understand that some of you aren't in a financial position to give, and you can still help. Please use the buttons below to help spread the word by sharing this blog post with your online networks on FaceBook and Twitter. Every post helps. Many corporations will match their employees' gifts to the Mattress Factory with an equal corporate contribution. Check with your human resources office for details. You also can contact me, Lindsay, at lindsay [at] mattress [dot] org or 412-231-3169 and I’ll ask for you. Naturally, the thing I look forward to most during a run of an exhibition here at the Mattress Factory is the educational programming my department produces. Through workshops, lectures, outreach events and artist/school partnerships, I love helping create opportunities that connect MF artists with the public and programs that encourage viewers to consider the relevance of art & creativity in their own lives. The next such event will take place this Saturday, November 7, here at the museum. I invite you to join Gestures 13 curator Katherine Talcott and exhibiting artists Stephanie Armbruster, Jeremy Boyle, Jonny Farringdon, Nayda Collazo-Llorens, Amanda Long, Lindsay O'Leary, Drew Pavelchak, The Urban Gardner & Dror Yaron for an evening of artistic discussion and fall harvest treats. There will be a guided tour of the exhibition at 6:00PM and the discussion will begin at 7:00PM. 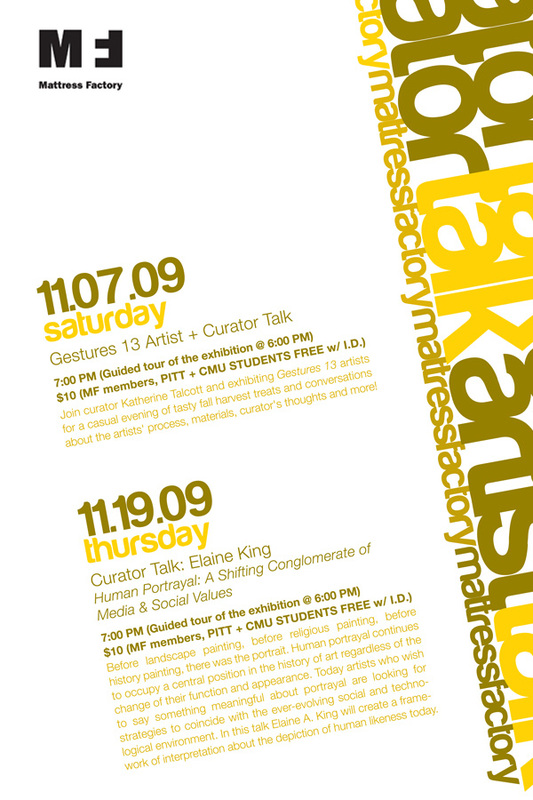 Admission is $10, but as always: MF members, PITT + CMU Students are FREE with I.D. I hope to see you Saturday evening! This is the first post from Catena Bergevin, Director of Operations here at the Mattress Factory. Catena has worked for the museum for more than 5 years and is responsible for making sure everything here at the MF runs smoothly. She is also dedicated to ensuring the sustainability of the Mattress Factory's earned income lines of business, which include museum admissions & membership, the MF Shop & BoxSpring Café and facilities rentals. Hello MF Blog readers! For my first blog post, I thought I'd focus on the amazing mission and people that make the Mattress Factory run smoothly each day. I'd also like to highlight some special initiatives we have cooking for the holiday season. I know, I can't believe the holidays are right around the corner either! Where did the time go? Certainly, the holiday season fills each of us with a renewed "spirit of giving." Well, that is a year-round mantra here at the the Mattress Factory. During the almost half-dozen years I've been working here, I have seen MF staff go far beyond what is written in their job description. From visitor services staff to building maintenance, each face of the MF believes strongly in our mission and works diligently to support the art. Many of our staff members are artists themselves or volunteer for other arts organizations. They truly bring the spirit of giving an inspirational meaning. Did you know that museum visitors and our friends from afar can also give back to the MF in a variety of ways? This might surprise you, but the museum relies heavily on earned money (i.e. paid admissions, shop and cafe revenue, membership, etc.). Approximately 30% of the MF's operating budget comes from earned income. My passion here has always involved finding ways to realize the museum's earning potential. (Not to mention that I absolutely adore retail!) In 2005 we opened the MF Shop and in 2006 the Boxspring Café. We also expanded our facility rental business with the addition of a full time Event Coordinator. So this holiday season, we're launching the GIVE TWICE initiative. Each and every purchase, not only gets you something truly awesome (and by awesome, we mean MF awesome), but it also helps the Mattress Factory provide artists-in-residence with unparalleled support in creating new installations at the museum. So whether it is a new MF logo shirt, a green membership, a cup of soup, or a place to hold your next cocktail party, please consider supporting the Mattress Factory with your purchasing this holiday season! SHOP + EAT + JOIN + CELEBRATE = ART! Today's installment in the LIKENESS Video Series (produced with love by MF Danny) comes from Jonn Herschend, an interdisciplinary artist, curator and experimental publisher preoccupied with how emotional confusion, absurdity and veracity play out in the realm of the everyday. He lives and works in San Francisco, and is the co-founder and co-editor, along with Will Rogan, of the experimental publication THE THING. Jonn was raised in a mid-western theme park in the Ozarks that his grandfather started. Later it was run by his father and uncle. Both of his parents were street performers and when Jonn was born, a sign was placed in his parents’ front yard that read, “Home of Jonn Herschend, future train robber.” According to Jonn that sign is still around. The entire installation is a self-portrait...not one part. It’s both sides of the entertainment experience... the fantasy of the gallery and the hidden reality. It goes from the conceptual notion of a museum installation, to a disruption with the physical space (the leak in the ceiling), to a hidden and nostalgic projection of a true moment of complete innocence. This is the first time I’ve ever really worked on a piece that referenced my affiliation with the amusement park of my past. For me, museums and galleries are very similar to amusement parks. They are where we come to experience a diversion from the real world. And we expect things to be a certain way. From a formal aspect, the PowerPoint projection (an application used to supposedly make confusing issues clear) becomes bogged down and sidetracked with the introduction of an illicit affair and car wreck. Today's installment in the LIKENESS Video Series (produced with love by MF Danny) comes from Paul DeMarinis, an artist who has been working in electronic media since 1971. Much of his work involves speech processed and synthesized by computers. In his LIKENESS piece, Dust, Paul utilizes a diverse selection of materials to create a unique and moving experience. Paul DeMarinis has been working in the arts for several decades and subsequently has produced numerous performance works, sound and computer installations, as well as interactive electronic inventions. DeMarinis’s subtle and magical works display an intersection of tradition and progress, often motivated to cover an expanse of subjects and themes. Today we hear the term multidisciplinary! It is indeed an accurate one to describe Paul DeMarinis. Although the majority of his productions fall within the realm of art, he is also a historian, an experimenter, a chemist, a physicist, an engineer, a programmer, an inventor, a computer scientist and an archaeologist. His cross-disciplinary approach affords him an aptitude to condense the many facets of technology into his art constructions that aspire to be concurrently comprehensible and philosophical. Today's installment in the LIKENESS Video Series (produced with love by MF Danny) comes from artist Jim Campbell. Jim has two pieces showing in the LIKENESS exhibition, one of which you see below (Liz Walking: A Distillation Portrait) and the other will be posted here on the MF blog later in the week. Both make use of custom electronics and LED lighting. In Liz Walking, Jim has transformed an entire gallery into a lo-fi projection screen. To shine a bit more light on Jim's creative process, I've included some text from curator Elaine A. King's gallery guide below the embedded video. Liz Walking: A Distillation Portrait develops out of Jim Campbell's earlier Motion and Rest series that depicts six studies of people with disabilities walking. The idea underlying this series was that the low-resolution process inherently eliminates everything about the walking figures except for their gait. 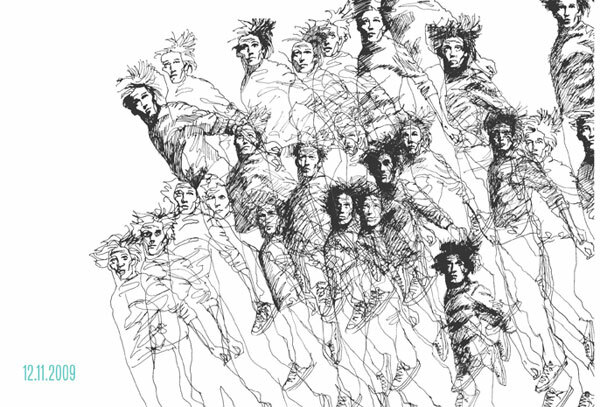 According to Campbell, "the works (or medium) distill the movement of the figures eliminating all of the other information from the moving images (age, clothes, gender, hair style etc. cannot be determined from the representations)." On Friday, October 9th, nearly 300 people packed into the galleries for the concurrent openings of LIKENESS, a group show guest-curated by Elaine A. King, and It's all about ME, Not You by Greer Lankton, which has been added to the museum's permanent collection. Big thanks to all who attended. I'm always amazed at the consistent outpouring of support at MF openings. In anticipation of receiving and posting the official LIKENESS documentation images from our photographer, I'll be uploading short videos produced by Danny Bracken, multi-instrumentalist extraordinaire and MF Exhibitions Team member. First up in the series is Tony Oursler's Vampiric Battle. In 1996, the Mattress Factory had the good fortune to work with Greer Lankton as part of a group show that was guest-curated by Margery King. Greer's piece in that show, It's all about ME, Not You, was a large-scale recreation of her Chicago apartment/studio and housed dozens of the artist's hand-made doll figures, photographs, collectibles, and -- perhaps the focal point of the installation -- an addict in a bed surrounded by pill bottles. Shortly after the show opened, Greer Lankton passed away and upon the close of the show, we put the entirety of her piece in storage. The Lankton Family has generously given Greer's final piece to the Mattress Factory and with the amazing help of several other supporters, we will be adding It's all about ME, Not You to the museum's permanent collection. The opening reception is next Friday, October 9th. You can RSVP and share the event with your friends over on FaceBook. My role as archivist here at the museum involves documenting, preserving and cataloging artworks or, in most cases, artifacts of artworks. Because of the volume, diversity and fragility of the materials she used, Greer's piece has proven to be a labor of love for me. Many of her doll sculptures are made from delicate materials like toilet paper so implementing proper handling and preservation processes are very important. 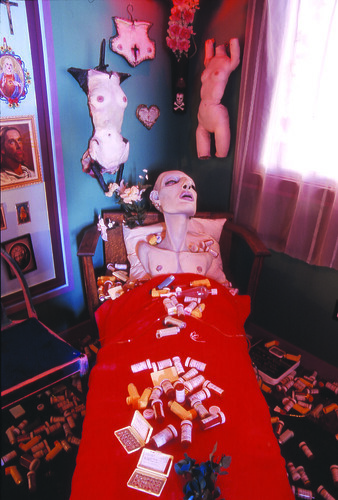 When faced with the prospect of creating her first large-scale installation at the Mattress Factory, Lankton knew that she wanted to re-create her studio, in an ideal form, designing an environment of "artificial nature/total indulgence," filled with "dolls engrossed in glamour and self abuse." Like the artist herself, Lankton's dolls and environments possess a disarming mix of innocence and decadence, hope and pathos. She said her work was "all about me," reflecting her life as an artist, a transsexual, and a drug addict. But beyond this, from her position as an outsider, Lankton eloquently explored and questioned accepted norms of gender and sexuality, as well as the powerful imagery of popular culture and consumerism. Her work also describes the difficult mandate of these pervasive, seductive models and the pain of those who do not conform. It is tempting to think that Lankton created her installation at the Mattress Factory as if she knew it was her last (she died in late November, a month after the exhibition opened), filling the space with a retrospective selection of her beloved dolls and everything that was most meaningful to her. In this video, shot at the 1995 Whitney Biennial, Greer talks about two of her sculptures: a bust of Candy Darling and one she calls Blue Babe. The audio and camera quality are a bit shaky, but it's really great to hear the artist herself speak about these works. A great moment comes at 1:06 when a gallery attendant tells Greer not to touch the art and she says simply, "It's mine!" Coincidentally, this Candy Darling sculpture is now on view as part of It's all about ME, Not You. Speaking for all of us here at the Mattress Factory, we feel very lucky to have the ability to show It's all about ME, Not You permanently. Greer's work has touched many people's lives over the years and we look forward to helping enable that connection for new generations into the future. One of the most unfortunate occurances for me last year was being out of town during PodCamp Pittsburgh 3, which took place in October of 2008. Well, lucky for me (and hopefully you!) PodCamp Pittsburgh 4 is coming up in a just few short weeks (October 10 + 11). For those of you thinking, "Pod-what?," PodCamp is a FREE community UnConference, run by and for people who create, enjoy, or are interested in learning more about social media. This year’s PodCamp Pittsburgh is bringing an exciting crew of social and new media makers to our city. Topics range from beginner-level to advanced, and cover a wide variety of learning sessions for writers, bloggers, vloggers, web developers, web designers, podcasters, business owners, job seekers and anyone interested in learning more. And what a great surprise to learn a few weeks ago that I'll be presenting two sessions, "myG20: Bringing Anarchists and Business Professionals Together Since 2009" on Day 1 and "Friendship 2.0: Community Building for Non-Profits" on Day 2. Check out the amazingly awesome two-day schedule in its entirety HERE. So what are you waiting for? Hop to it. Registration is FREE and easy. I hope to see you there!